I Read It! At Jennifer's House! 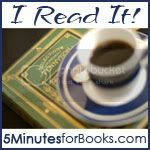 Of course, while I was at Jennifer's house, I took the opportunity given to read some of the books that she has been recommending to us at 5 Minutes for Books. 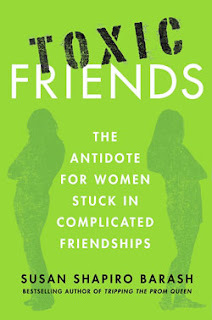 One of the books she had reviewed was Toxic Friends (click on the title to read her review) and I had been curious about it so she stuck it in her guest room for me to read. Having just re-read her review of Toxic Friends, I'd have to say it is pretty thorough and I don't have a whole lot to add to it. Barash gives a decent look and basic definition of each type of friend, giving the reader some questions to ask themselves about the type of company that they are keeping. The idea is that the reader is able to identify what types of friends they have, pinpoint any difficulties, and make any healthy relationship changes that might be necessary to live more happily and peacefully. True, honest-to-goodness authentic friendships do not come cheap or easy. They take a great deal of nurture and care and you have to really WANT the friendship and be willing to work (hard) for it to make it last. I think that's true across the board. Anything worth having is going to cost you something - you just have to decide if the cost is worth it! I really don't know who to recommend this book to. I think it spells things out in a practical and "hip" sort of way (i.e., "frenemy") and is, at the very least, an interesting read. Being that humans are naturally relational, it's good to think through why we have the friends that we do from time to time. I think it's easy not to give a lot of thought to the relationships that we build with others. Furthermore, today's society makes it hard to "dig deep" into friendships and explore them for the blessings that they are or could be. Making wise choices when it comes to friendship is certainly a topic that could stand a little attention and for that reason, I enjoyed this read. Thanks, Jennifer, for setting it out for me! And they WERE funny. And I DID laugh. And while I was reading them, Kyle walked into the room and declared, "OH! I LOVE Elephant and Piggie." Dawn, you'll be happy to note that I, too, am a converted Elephant and Piggie fan. I think that's the extent to which I can claim a love for Willems at the moment, being that those are the only books I've read. But I thought you would be pleased. It's progress - right? WOO-HOO!!! Welcome to the world of Mo Willems, Carrie!! Trust me, E&P are fabulous, and his other works are just as fun. And seriously, your kids will adore hearing them read aloud. If your library allows you to put books on hold online, I suggest going through and swooping all the Willems into your online cart. :) Just look at it as a sneak preview of the W's for your other blog! I didn't really catch the whole "shared benefit" thing about friends, but I agree. The "benefit" could be many things from shared interests (a friend who also likes to discuss/see/do the same thing as you), or playdates because their kids are the same age, or a mentor (where they get the "benefit" of sharing their wisdom, I guess). Mo Willems! My girls LOVED Knuffle Bunny. They haven't enjoyed the others as much, but that might be because they were a little young for them. So glad you're back and had a great time! I really want to get this one.. I'd have to ponder the "shared benefit" thing. I think that's generally true -- usually the friendship arises because of some common interest, etc. But it also makes it sound like "Unless there is something in it for me, I'm not interested." I've had some friendships where I think it was definitely more about the other person, and I guess whether that becomes "toxic" depends on how much it impacts one's one mindset, family, etc. There was one particular friendship that, had it continued, might have been a problem from the neediness of the one involved, but a move put some distance between us. Yet I think the Lord used it -- sometimes we have to make ourselves available to others with little or no seeming benefit to ourselves. Barbara - Yes. That's kind of along the lines of what I was thinking. When I read that quote in the book, it FELT (not sure if it's what she meant, but it's what I felt) that if we aren't getting something out of a relationship when it's not healthy. And I don't really think that's entirely the point she was trying to make, nor do I think it's the case. Certainly, sometimes friendships are remarkably unhealthy and there's a whole lot of "take" on one side and not very much "give" to help balance things out. That can be physically and emotionally draining! But at the same time, being a Christian, I think that God can and does use any type of relationship to teach us more about Himself. So I guess I'd end up on the side of saying, "All things work together for good..." and even a bad relationship can prove a hidden blessing. Still. All that said - I do think it's important to note the unhealthy relationships and balance them out in a Biblical manner.